A good hair day is the barometer most of us use to assess how well our day is going – so just imagine the feel-good factor of a hair and spa holiday? Let’s face it, most sun, sea and sand getaways are a nightmare for our locks as we face the challenges of trying to look our best despite the drying effects of water, chlorine and over exposure to those UV rays! And this is exactly what’s on offer at the Stuart Holmes Hair & Beauty Spa Salon, in Regency Cheltenham, which invites you to kick back for a few days and enjoy a bit of self-indulgent, head-to-toe pampering – and why not? Hair Holiday’s is the brainchild of celebrity stylist Stuart Holmes, who, with his wife Sara, opened the hair and beauty salon in 2003 after cutting hair in London since the age of 17. 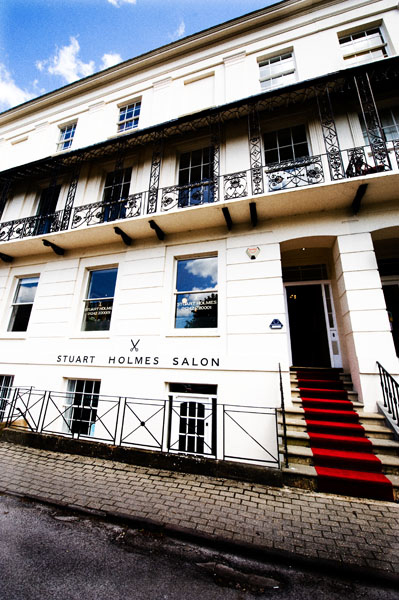 As increasing numbers of loyal clients made overnight pilgrimages from across Britain and overseas, Holmes came up with idea of the Hair Holiday which includes bed and breakfast in a five-star hotel, a haircut and colour, two blow-drying sessions and plenty of beauty and massage treatments. Tempted? 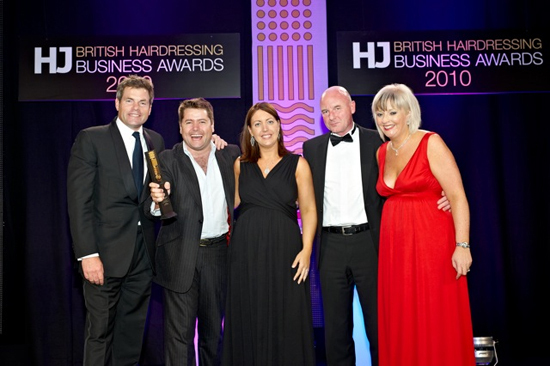 So was I which is how I found myself walking up the red carpet to the four-storey salon and spa which has just been voted Salon of the Year by a specialist panel of industry experts from the Hairdressers Journal Business Awards. Attention to detail is the name of the game and I was immediately welcomed into the spacious reception area and offered a drink and a magazine while I waited for my therapist. 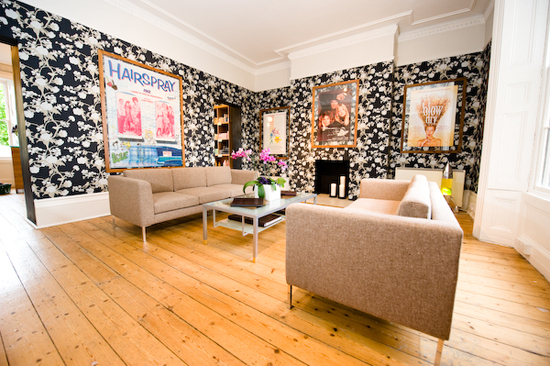 Unlike many chains, the salon has a homely atmosphere and has the wow factor of an interior designed by TV celebrity Laurence Llewelyn-Bowen who has worked his magic using bold black and white wallpaper. Before I could get stuck into my magazine I was whisked off to the therapy room where I was treated to the ultimate pampering pedicure which left me walking on air. It was then time for my cut, colour (using Shu Uemura products) and manicure which were carried out at the same time – which is wonderful for women-on-the-go who don’t have the luxury of time when not on “holiday”. By the end of my appointment my unruly mop had been transformed into silky, bouncy locks which actually swung when I walked – it was quite amazing. “For many years, lots of my clients have been travelling long distances to the salon which I guess is a real tribute to the team we have here, said Holmes. Holmes, who is styling Gok Wan’s hair at The Times Cheltenham Literature Festival (which runs from October 8- 17 2010) also offers “holidaymakers” a complimentary blow dry at the end of day one so you can hit the festival or those designer stores feeling perfectly-groomed. • There is a minimum age limit in the spa of 16 but children can use the outdoor pool only. • Save to your phone and send to family and friends! • Blow dry at the end of day one. Include two night’s accommodation. Prices for the weekend start at £427 per person based on two people sharing. (Friday and Saturday night) Single supplements apply. Overlooking Imperial Gardens, and voted in the top 10 Boutique bed and breakfast’s in the world by the Mr and Mrs Smith Guide, Thirty Two offers five star guest accommodation in a landmark listed regency building. This boutique property has four luxury rooms that provide a quiet and exclusive haven for the most discerning traveler. Is a beautiful hotel located close to the famous Cheltenham Ladies College and just five minutes walk from the salon. Stylish and contemporary bedrooms provide guests with the ultimate place to relax in. The hotel also has an award winning brasserie, Montys, and a trendy cocktail bar.